Utah law requires all potential peace officers to receive basic training before they can be certified and function with any authority in the state. The POST Basic Training program provides the required training for law enforcement officers. POST also oversees and regulates several satellite academies which also offer basic training programs. POST conducts six regular sessions per year. The six regular sessions are divided into two blocks, the Special Function Block and the Law Enforcement block. The Special Function block is five weeks of training, The Law Enforcement block consists of an additional ten weeks of training. To be certified as a Law Enforcement Officer, a person must complete both blocks. The two blocks together are referred to as one session. 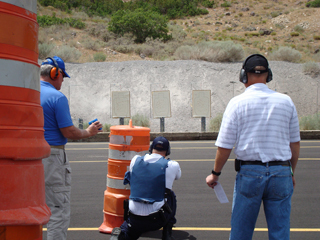 The mission of the Basic Training Bureau is to provide professional law enforcement training utilizing progressive adult learning concepts, innovative technology and research to meet the needs of Utah’s law enforcement community and the citizens they serve. Indeed we realize that our customers are not only the Chief Administrators of the law enforcement community and the cadets, but also every member of this great State. We believe that it is imperative to make the cadet’s experience a positive one that will leave positive, valuable memories with them for the rest of their lives. We hope that they will carry our professionalism with them throughout their careers. The Basic Training Bureau is committed to providing the best and most updated training that is possible.